Variable-geometry turbochargers (VGTs), (also known as variable nozzle turbines/VNTs), are a family of turbochargers, usually designed to allow the effective aspect ratio (A:R) of the turbo to be altered as conditions change. This is done because optimum aspect ratio at low engine speeds is very different from that at high engine speeds. 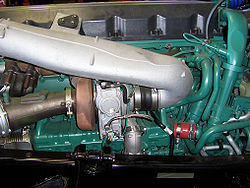 If the aspect ratio is too large, the turbo will fail to create boost at low speeds; if the aspect ratio is too small, the turbo will choke the engine at high speeds, leading to high exhaust manifold pressures, high pumping losses, and ultimately lower power output. By altering the geometry of the turbine housing as the engine accelerates, the turbo's aspect ratio can be maintained at its optimum. Because of this, VGTs have a minimal amount of lag, have a low boost threshold, and are very efficient at higher engine speeds. VGTs do not require a wastegate. In trucks, VG turbochargers are also used to control the ratio of exhaust recirculated back to the engine inlet (they can be controlled to selectively increase the exhaust manifold pressure until it exceeds the inlet manifold pressure, which promotes exhaust gas recirculation (EGR)). Although excessive engine backpressure is detrimental to overall fuel efficiency, ensuring a sufficient EGR rate even during transient events (e.g., gear changes) can be sufficient to reduce nitrogen oxide emissions down to that required by emissions legislation (e.g., Euro 5 for Europe and EPA 10 for the USA). Another use for the sliding vane type of turbocharger is as downstream engine exhaust brake (non-decompression-type), so that an extra exhaust throttle valve is not needed (turbo brake). Also, the mechanism can be deliberately modified to reduce the turbine efficiency in a predefined position. This mode can be selected to sustain a raised exhaust temperature to promote "light-off" and "regeneration" of a diesel particulate filter (this involves heating the carbon particles stuck in the filter until they oxidize away in a semi-self-sustaining reaction - rather like the self-cleaning process some ovens offer). Actuation of a VG turbocharger for EGR flow control or to implement braking or regeneration modes in general requires hydraulic or electric servo actuation. In 1991, Fiat puts a VNT in the Croma's direct-injected turbodiesel. The Koenigsegg One:1 (a reference to the car's HP to curb weight ratio of 1:1,) launched in 2015, uses twin variable geometry turbochargers on its 5.0-liter V8 engine, allowing it to produce an impressive 1361 horsepower and become the world's first "Megacar." ^ "Increasing the Efficiency of an Engine by the use of Variable Geometry Turbochargers" (PDF). IJIRSET. Retrieved 11 April 2016. ^ "Turbo Pioneer". honeywell.com. Retrieved 2014-01-22. How does Variable Turbine Geometry Work? This page was last edited on 5 October 2018, at 04:56 (UTC).